Let me ask you if this sounds familiar. You somehow got into the mortgage business and felt it would provide you with a way to earn a great living and have a great profession. You took the courses and passed the tests and here you are ready to generate new loans. When you started, and to this day, you probably believe a few things to be true. Take a minute and check these off I’ll wait. – You MUST be available 24/7/365 and always return your phone calls. – You MUST work very hard to get referrals from Realtors and past clients since they control the business. -You MUST have all of the programs available today and the best prices. I know that this was the way I viewed the business when I started 32 years and nothing has really changed for most originators. Years ago I was fortunate to speak at an event where one of the other speakers was the famous marketer Jim Rohn. He spoke for about 90 minutes but I heard one sentence that literally made me sit up in my chair and say AHA! You might even want to write that one down so you can refer back to it often. But lets’ see how this applies to our business and how you can use it to change it. I actually could and should write a book on this topic alone but let’s cover the top 3 in this article. YOU MUST HAVE A LARGE STABLE OF REALTORS AND OTHER PROFESSIONALS IF YOU WANT TO BE SUCCESSFUL. I remember when I first started in the business the deal was to go out to Realtor offices and builders and cold call. We were taught to feed them , be available all the time, and drop of flyers with rates and information. The rule in our business was that Realtors and Builders as well as other professionals like accountants and attorneys controlled the buyers. If you wanted to build business than you needed to get them to refer their clients to you. Most originators are still operating with this as the premise. But what if you were able to simply switch the tables and get them chasing you? I want you to stop reading for a minute and let what I am about to tell you really sink in. YOU MUST CONTROL THE BUYER SO YOU CAN CONTROL YOUR INCOME !!!! There is no rule or law that says buyers should call a Realtor or any other professional when they are looking for a home. In fact, calling a Realtor is actually backwards when you stop and think about it. The first thing a buyer should do when they are looking for a home is to meet with a lender. That way they can determine what programs are best, what their comfort levels are, and what price ranges they should be targeting when they finally do meet with a REALTOR or Builder. Your job then is to get in front of the buyers BEFORE they get to anyone else. One of the obvious groups would be people who are currently renting and ready to buy. YOU MUST HAVE GREAT RATES AND POINTS AND ALL THE PRODUCTS TO SUCCEED. Again, what you are doing and were taught is completely illogical. Think about what we do. We need business so we go out and start marketing. We get leads if we are successful and then we try to find the correct programs to put these people in. BUT WHAT IF WE ONLY MARKETED TO THE PEOPLE WE KNEW MET THE CRITERIA FOR THE PROGRAMS WE ALREADY OFFER? The truth is that they are easier. Step 1 is to see what programs and overlays your company has. Then only market to people who fit the criteria for the programs you offer. FHA /VA both allow buyers to be discharged 2 years from their bankruptcy to be eligible. So go to a list broker and market only to those buyers who meet those criteria and are currently renting. There are a number of lenders I have found and worked with that offer programs 1 day after bankruptcy. Meet with their reps and learn their programs. ONLY MARKET TO PEOPLE YOU KNOW YOU CAN HELP BASED ON THE PROGRAMS YOU HAVE! YOU MUST WORK LONG HOURS AND ALWAYS BE AVAILABLE. This one is actually true if you are what I describe is a “Head of Lettuce” loan officer that is a generalist instead of being a specialist. You must be available when you don’t control the buyers and you are seen as a commodity. But when you become a specialist people expect to meet with you during YOUR hours. They expect you to charge more because you are solving a particular problem. There is a place in business for both Walmart and Tiffanys as well as Brooks Brothers and Mens Warehouse. They have very different hours and very different expectations. Take a minute now and design your business so that you control your business and your income so you can finally close more loans, make more money and enjoy your life. LAST EVER LIVE BOOMERANG EXPERT TRAINING SO YOU CAN SEE HOW TO FINALLY SOLVE THESE ISSUES…..
http://www.toporiginatorsecrets.com/wp-content/uploads/2016/12/8.png 0 0 Brian Sacks http://www.toporiginatorsecrets.com/wp-content/uploads/2016/12/8.png Brian Sacks2017-11-26 19:46:482017-11-28 13:36:18ARE YOU ORIGINATING BACKWARDS? Hope you had a great holiday. We had over 20 people over yesterday for dinner. Some were not able to make it because they had to work while a few others were anxious to leave early so they could get some of the special sales available when the stores opened early. This got me thinking about us as originators and the different business models we use to generate new business. THERE ARE WALMART LOAN OFFICERS. Like Walmart they compete on price. They must be available 24/7/365 like a Walmart superstore. They will and regularly do lose deals because of price because they offer nothing special. Walmart loan officers work on Thanksgiving and must excuse themselves from dinner and other family occasions because they MUST take that call or meet that clients or go to that meeting. Have you seen the Tiffany’s commercials and flyers for their Black Friday sales? No of course not because they don’t have one. Their employees and clients were enjoying their Holiday dinners uninterrupted. 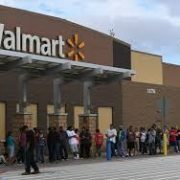 Yes- they will be busy today but they will do way fewer transactions than a WALMART jewelry department and their prices will be 10-20 time higher. BOTH HAVE LOYAL FOLLOWINGS BUT WAY DIFFERENT EXPECTATIONS FROM THEIR CLIENTS AND WAY DIFFERENT DEMANDS ON THEIR EMPLOYEES AND MANAGERS. I have to confess that for my 15 years in the business I truly believed that I had to be available 24/7/365-while offering the best price and giving the best service. Sometimes I would do a deal for free just so I would not lose the relationship. Truthfully, I did ok , not bad , not great but made a decent living. But I was constantly exhausted and very often grumpy and mean. I figured there had to be a better way and then I set out to figure it out and I did. IF YOU ARE AN EXPERT SPECIALIST INSTEAD OF A GENERALIST YOU WIN. Let’s go back to our example of Tiffany’s and Walmart. When you buy jewelry at Walmart no one will stop you and saw WOW ! When you buy jewelry at Tiffany’s people will stop you and say WOW! Buyers are price sensitive at Walmart but not at Tiffany’s. Tiffany’s is NOT OPEN 24/7 but many Walmart’s are. Tiffany works on higher priced items with higher margins. Walmart works off penny’s. NOW – Please don’t be offended – but Walmart attracts lower end buyers while Tiffany’s attracts higher value clients. SO WHAT DOES THIS MEAN FOR ORIGINATORS? Very simple – you have to stop hoping and actually choose which business model works best for you. I prefer to work on higher end transactions and be more elite than worry about price. I prefer to be sought out and known for my expertise in a niche than trying to be everything to everyone. Now don’t misunderstand- I still do FHA – VA – CONVENTIONAL and even Bond and grant programs. But I don’t compete on price. Just yesterday I lost a deal because my price was an 1/8th higher. Now that might have upset me many years ago and losing a sweet 20% down easy 200,000 conventional loan might upset you. But if you KNOW that you have more business coming in than you can handle because you are a sought after expert- the OBVIOUS GO TO EXPERT- well that takes the sting out of it doesn’t? IF you are not yet a member of the Boomerang Expert Implementation Program you should grab a seat for what may be the final LIVE TRAINING for this program. WATCH BEFORE 11-20-17 – THIS IS SO SAD! Hope your weekend is off to a great start. I’m spending the day working on my project and can’t wait to share it with you. But I wanted to tell you a sad story about a call I had yesterday with an originator who wants to be in my coaching program. He scheduled his 15 minute consultation and we spoke yesterday about the activities he was going to do this weekend and that’s where this story gets sad. I truly can relate to it because it’s exactly what I used to do myself before I created the rentersintoloans formula and perfected it. Needless to say he is frustrated and unfortunately he is also broke -both financially and emotionally and not able to control either. Having been there and done that myself I can truly relate but instead of moping I found and created and perfected a solution. BTW- speaking of sad based on the e-mails we have been receiving I know so many of you are sad that I have decided to take this program off the market but there will be NO EXCEPTIONS. Once it’s gone it’s gone forever but to be fair if you hit the paypal option you can take it for a full six month test drive without spending one red cent since they offer zero interest and zero payments. that way you can start generating new deals and relationships and your money excuse is gone. http://www.toporiginatorsecrets.com/wp-content/uploads/2016/12/8.png 0 0 Brian Sacks http://www.toporiginatorsecrets.com/wp-content/uploads/2016/12/8.png Brian Sacks2017-11-18 17:00:322017-11-18 17:00:32WATCH BEFORE 11-20-17 - THIS IS SO SAD!